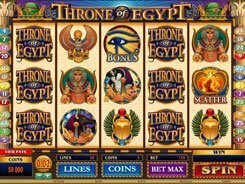 This 5-reel 25-payline slot looks like jumped out of a page from a fairytale. 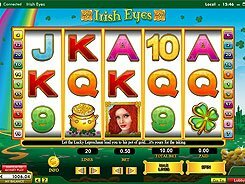 Set against a rainbow and a picturesque rural scenery, the reels feature Irish-themed symbols: a four-leaf clover, a gold-filled pot, Leprechaun, a red-haired lady and a few standard playing card icons. 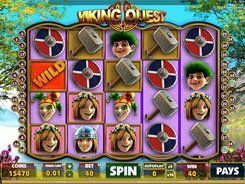 Irish Eyes is a fairly easy slot with a wild, a scatter, free spins and a Pick Me bonus. Adjusting coin sizes and the number of coins per spin, you can wager $0.01 to $125. 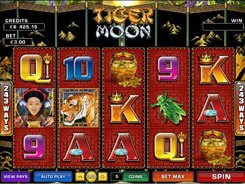 The grand prize of x10,000 times a bet is awarded for a wild symbol (Leprechaun) if five of them land across a payline. 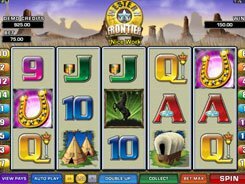 Three or more scatters (the Lady symbol) trigger 12 free games with tripled wins. Along with tried and tested wilds and scatters, Irish Eyes offers the Pick Me bonus round activated when Leprechaun appears on reels #1 and #5 at a time. In the bonus feature, you are to take a pick from a few items and reveal a prize hidden underneath. 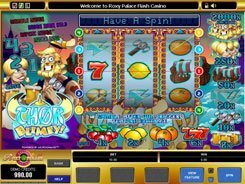 Irish Eyes is a funny enjoyable slot with a quality cartoonish artwork, a few bonus features and generous prizes.